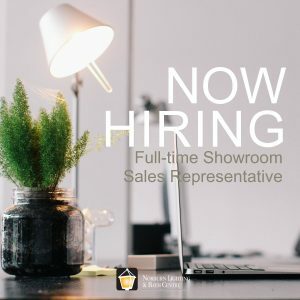 Posted March 24, 2017 by Norburn Lighting and Bath Centre & filed under New Products . 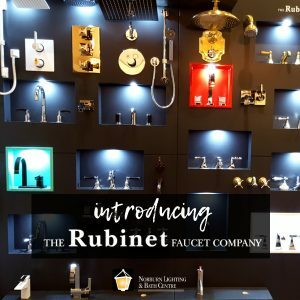 Bordeaux, Purple Haze, and Aqua are just a few finishing options you can get from the Rubinet Faucet Company that offer plumbing accessories suitable for residential and commercial spaces. Rubinet products can be seen in hotels such as Atlantis on Paradise Island, Palmilla in Cabos San Lucas, and condominiums such as Turnberry Place in Las Vegas. 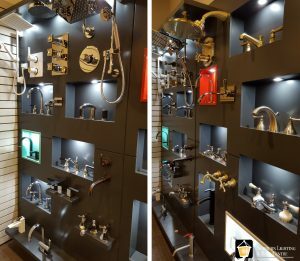 Rubinet is also proudly Canadian, producing innovative and quality faucets and other plumbing accessories since 1982, using hand-crafted techniques with state of the art technology. Of course, Rubinet also supplies quintessential finishes, such as chrome, nickel, brass and even matte finishes that stand the test of time. What ever your desire may be; whether you want to make a bold statement with a fiery red finish, or prefer a classic chrome finish, Rubinet has something for everyone. Aside from the variety of finishes (twenty-one finishes to be exact), Rubinet also ensures their products meet appropriate regulations. These products are constructed with material that comply with plumbing supply fitting and water conservation regulations. In addition, the products are tested for lead to ensure safe consumption of water. 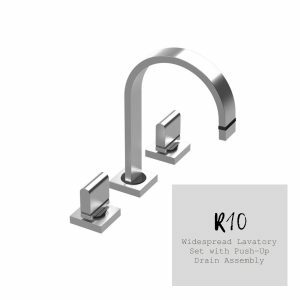 From the square handles to the slender faucet stem, the R10 focuses on a linear design that provides a sleek modern aesthetic. 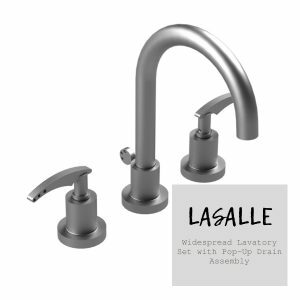 The Lasalle has a transitional appeal, with a more rounded faucet stem, and curved lever handles. 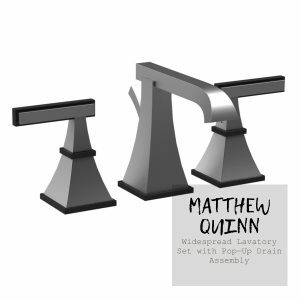 The Matthew Quinn has a simplistic design that allows you to mix different finishes together. 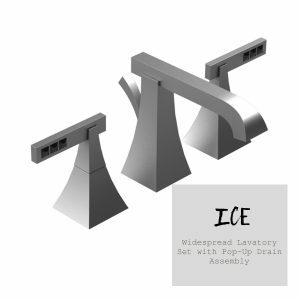 For a luxury feel, the Ice basin set has linear lever handles accented with Swarovski crystal inlays. The Swarovski crystals are available in plain, black, or clear. 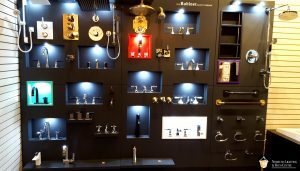 During your next visit to Norburn Lighting and Bath Centre, be sure to check out our new Rubinet display, featuring basin sets, shower heads, and other kitchen and bathroom accessories. Our experts in lighting and bath products can help you make the right decision in any room of your home. Posted March 10, 2017 by Norburn Lighting and Bath Centre & filed under Trends . Some of the best trends are from past eras that resurface and are redefined as current. Trends are cyclical, which allows us to integrate the beauty of past designs into our contemporary home. This coming season we are featuring items that give homage to past eras. The popularity of crafted material was dominant during the early 1900’s, during which the Art Nouveau Movement occurred. This was a period that defied the sub-ordinance of crafted art, such as glass work, to other forms of art that was considered more superior, such as sculptural work. Artists such as Louis Comfort Tiffany had a profound influence with this movement, which emphasized on the importance of craftsmanship. The Tiffany lamps from Quoizel epitomizes the artisan work from this era, which the company has been perfecting since the 1930’s. The table lamps are hand assembled using the copper foil technique introduced by Louis Comfort Tiffany. 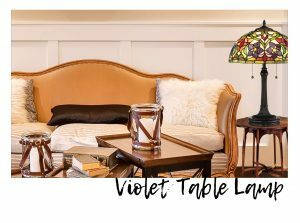 The Violet table lamp and Vintage Bronze Tiffany lamp are designed with a dome shaped shade that provides a spacious canvas for realistic sceneries of nature. The Violet table lamp has budding violets surrounded by a motif of green, yellow, red and tangerine glass. 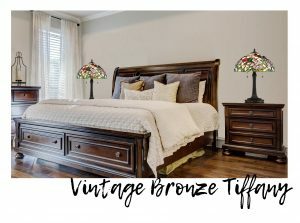 The Vintage Bronze Tiffany lamp has the same dome shaped shade but with a soft scalloped edge that follows the movement of the leaves, and depicts a scenery of hummingbirds drawing nectar from a patch of flowers. 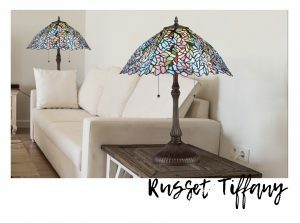 The third Tiffany lamp is finished in Russet, and has a more complex design due to the irregular shape of the shade. 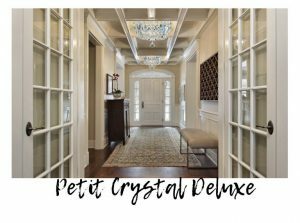 The trim of the shade also appears more rugged, and has a subtle branch that stems out from the crown and seamlessly blends into the mosaic of pastel glass. These lamps have a sense of ornamentation that brings life to a room that cannot be ignored. 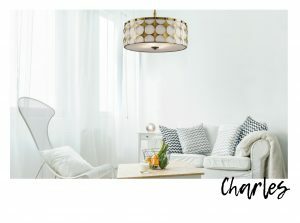 The chandelier has been around for centuries, which attest to the idea of the resurgence of style. The Regency Moderne style, in particular, was a hit around the 1930’s to 1940’s. Regency Moderne was inspired by the production sets in Hollywood that were lavishly decorated and over the top. This style incorporated a mix of Neoclassical, Art Deco, Chinoiserie and even had a hint of Modern influences. Dorothy Draper was an iconic figure during this time for her bold colour combinations and elaborate large scaled designs. 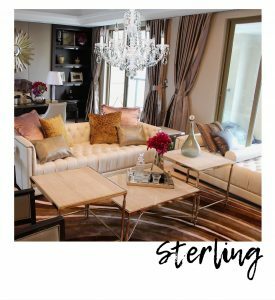 This style allowed for combinations of classic furniture with pops of vibrant colour, luxurious fabrics, and ornate additional touches, such as the use of chandeliers. These Schonbek fixtures exude the opulence of this style, enhancing the glamorous appeal of a room. The era of rebellion, the Sixties was considered the mod culture with iconic figures such as Jean Shrimpton and the Beatles that made a mark in popular culture. In interior design, David Hicks was highly idolized for his unapologetic use of bold colours. The Sixties embraced futuristic designs, bold colours and patterns, and geometric structures. Homes were decorated to reflect the individual and was a platform for creative expression. The economic boom, growth in technology, and various social movements also had an impact on the lifestyle and the interiors of homes. 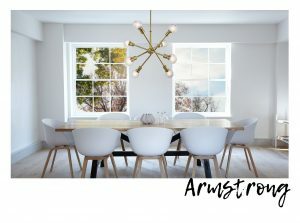 One of the most classic examples of mid-century modern design was the Sputnik, such as the Armstrong from Kichler, which is modernized with adjustable arms for variations in style. 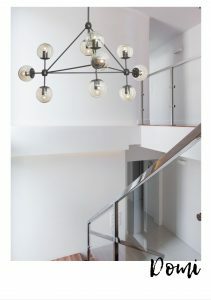 The Sputnik lighting design was popularized during the Atomic Age, and was inspired by the SPUTNIK1 which was the first artificial Earth satellite to launch in 1957, and would later evoke the Space Race that dominated most of the 1950’s and 1960’s. The Domi by Dainolite also has the atomic and geometric form that was popular during this era. 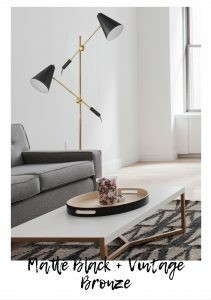 This floor lamp by Dainolite has an asymmetric composition and contrasts matte black with vintage bronze. Circular patterns—patterns in general—were used to make bold statements. The Charles pendant from Kichler has laser cut circular patterns that are reminiscent of this trend. Through out the years, it is evident that we rekindle our interest for past designs as they begin to resurface. The distinctive looks are unforgettable, and remind us that what was old will eventually become new again. 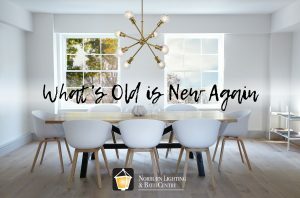 For more inspiration, head over to our instagram page @norburnlighting, and contact our showroom for expert advice on how to integrate “old” design into your contemporary home.